31-Dec-2003 -- It's been a few months now since we found this confluence point and I must confess that after losing all the digital photos I took while downloading them, I haven't had the heart to write this up. Fortunately, my son David took a few photos, so here it goes. David and I have wanted to find 15N 0 for some time now since we've already found 6N 0 and 14N 0, and we wanted to get another one on the zero line. For us it finally worked out to go up to 15N 0 during the kid's school break this past December. Since we have friends that live up in the northeast corner of Burkina Faso, we planned to visit them over the Christmas holidays. The day we left to find this confluence point was December 31, News Years Eve. Since our friends had others visiting them as well, our group of confluence explorers grew from 3, which included myself, David my son, and Rebecca my daughter, to 5 persons with the addition of Steve and Mark. The first 30 kilometers or so were straight forth and straight north. We left from Markoy, Burkina Faso and traveled north up a decent secondary road till we came to what we believed to be the boarder area between Burkina Faso and Mali. It was here that we needed to cross a wadi that still had water in it, but fortunately for us, someone had built a small rock bridge that enabled us to cross over and perhaps into Mali at this point. After crossing the wadi, the road we were on continued, so we continued on it till a time when this road started veering northeast whereas we now wanted to go northwest. So, we left the good road for a bit of off-road driving. It was here that we had to blaze our own path across a terrain that was somewhat hilly. Our GPS read 9 kilometers to 15N 0 at this time. 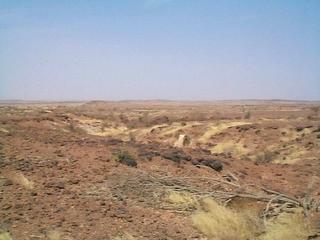 The first big obstacle we encountered was a rather large wadi that was all dried up. This wadi presented us with the risk of getting fairly well stuck in the sand, of which the bottom was made up. After successfully finding a crossing place and using four-wheel drive, we continued on and slightly upward. About an hour later, we still had about 3.5 kilometers to go. Our current situation found us encountering small ravines that had been cut into the sides of the hills by rain runoff. Since these small ravines where anywhere from 5 to 20 feet wide and 3 to 10 feet deep we had to spend lots of time looking for good places to cross over before going on towards 15N 0. My son David was spending most of his time as an advanced scout walking up and down the length of theses ravines looking for possible crossings. On two occasions, we had to back-track because of impassible crossing situations. After arriving at what seemed like another impasse, we started talking about getting out and walking the rest of the way, which was about two kilometers at this time. But in the end, we were able to find another crossing point and continued to an area that could be considered a small gorge. And it was here that the walk began. It had taken us two hours from the time we left the good road to travel the 9 kilometers and now we were about 300 meters from 15N 0. About 15 minutes later we located 15N 0 on the GPS. We took some pictures and lit off of some fireworks as it was New Years Eve and we had reason to celebrate. It's here that I'm saddened with my loss of digital photos. I had some real nice ones including one of our GPS reading 15N 0. After finding our confluence point, we sat down in the shade of my truck and had a picnic lunch. 15N 0 is a very interesting place: it's a desert garden of rocks for as far as you can see. It was also our most challenging Confluence to find to date. The borderline with Burkina Faso is passing about 545 m SSW of the Confluence.